Before I get into the meat of today's topic, I have to apologize for my own silliness. I mentioned at the beginning of yesterday's post that I hadn't let you all in on the fall version of Simple Marks. Well, if I'd just scrolled down the page a couple of posts I would have seen that, in fact, I did back when I participated in the Moda Blog Hop. So, never mind, I won't be posting preview shots of Simple Marks Fall. Been there, done that. What I haven't posted about is the bonus project I created for my online class at Craftsy.com. My class, Fabric Patterning with Wax Resist, walks you through all the steps that I use in my home studio (read: my garage) to create my hand dyed and patterned fabrics. When I was preparing the lessons for the class, I thought it would be fun to include a simple project to showcase the various techniques taught. And this project is definitely simple. It's really just 10 1/2" x 10 1/2" squares of fabrics that have been dyed and discharged using some of the methods discussed. I intentionally limited the color palette to hopefully unify the differently patterned fabrics. 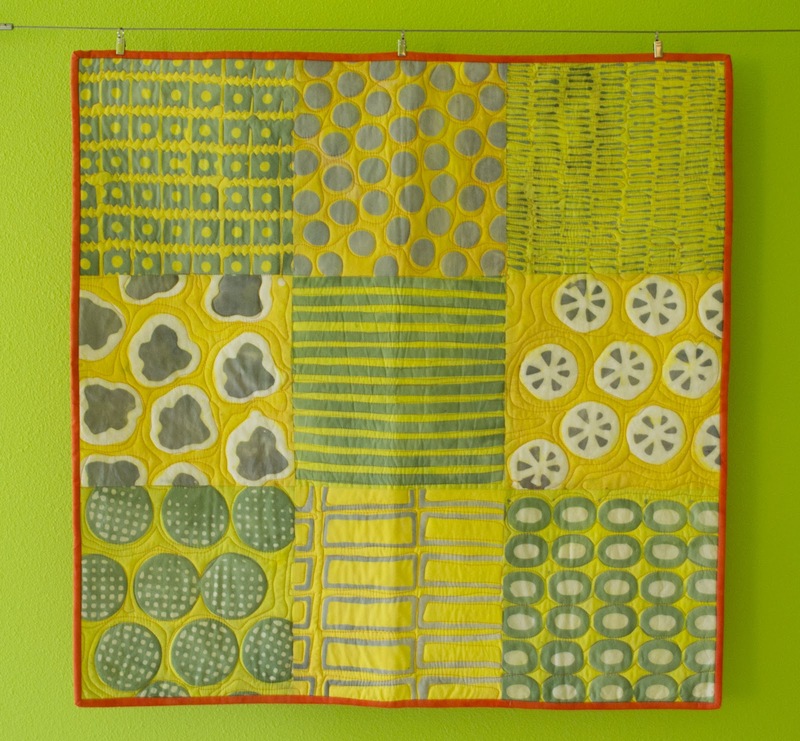 I then machine quilted it to highlight the images in the fabrics and bound it in orange. I wanted the binding to accent but not blend into the fabrics featured in the top. 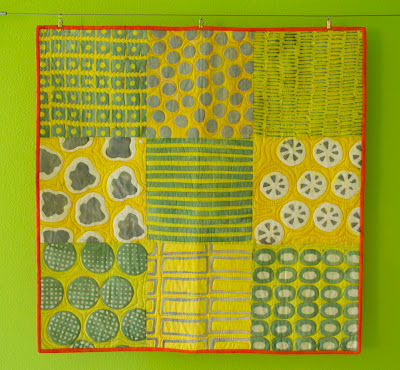 The nine-patch sampler measures about 30" x 30" and could be a functional baby quilt or a wall hanging. 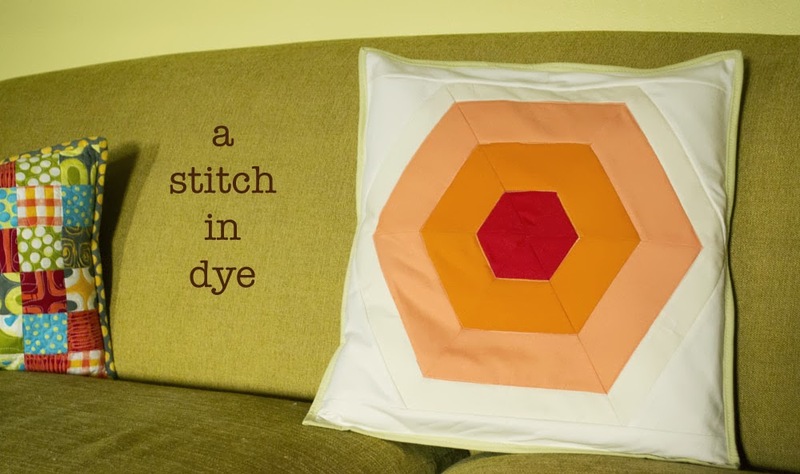 Either way, it's a great way to show off all your newly acquired dyeing expertise. Sounds like a fun class. Love your little sampler. The class does sound like fun as I was just thinking of doing some resist dyeing. Nice choice on the bright binding! That is art. Beautiful. Thank you. I recently signed up for this class and loved it. I just received my dye supplies today and hope to dye fabric this weekend. I can't wait. You did an excellent job in this video series! You mentioned you used Pima cotton. Can you tell me if you have a favorite supplier? Do you buy at the local Hancock's (which we have), Joanne's (which we don't), or do you buy a better quality? 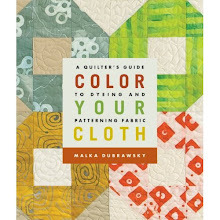 It sounds like you may be talking about a finer weave than the quality quilter's cotton (Kona, etc)?? Thanks so much.